Note: This is part 2 of the article “If it moves barcode it”, read part 1 here. We had 3 sets of barcode labels made, with separate ranges of numbers for drawings, prints and photographs, starting from DR00001, PR00001 and PH00001 respectively. These numbers were meaningless and the only important thing was that we knew which objects were in which box. I created a big spreadsheet which showed the correlation between all the different box numbering systems, and we then used this to create an upload to our collections database which changed the box numbers there. This was slightly nerve-racking as there was a risk of the cells in the spreadsheet going out of sync when they were being manipulated. However, undoubtedly the worst part of the whole operation was attaching the labels to the boxes. The labels were provided individually on backing material and had to be peeled off, and (as with double-sided sticky tape) it was only too easy to scrunch them up while you were detaching them! The best part about having the barcodes on the boxes was that we didn’t need to print or write out any lists to record new locations when we started to move them back into the building. We just scanned them with a mobile barcode reader (a Datalogic Skorpio mobile computer) and used that to record the moves, downloading an Excel file from it at the end of each day and then feeding a ‘box upload’ to our database. 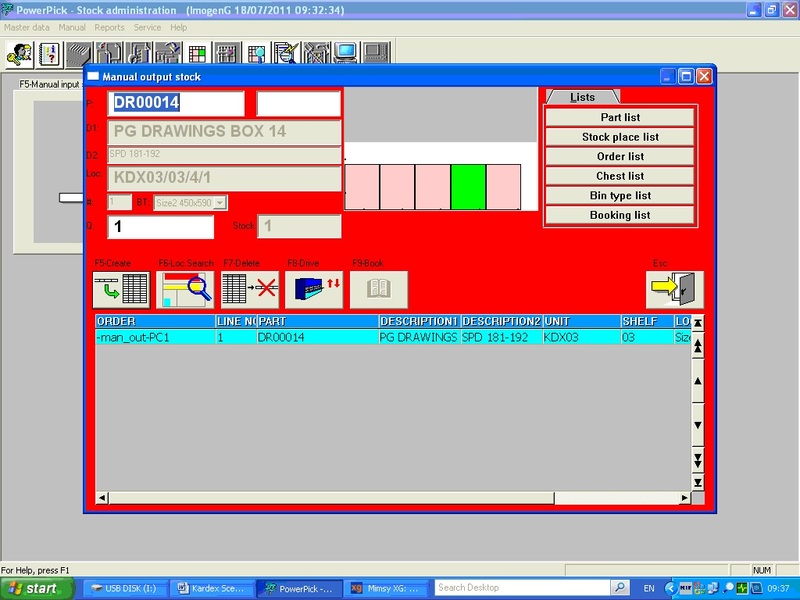 The software [PowerPick – see screenshot] that controls the three Kardex machines holds a small, simple database with a list of box numbers, two description fields which we use for the previous names for each box, and the location of the boxes within the storage system. The box number is used to enable people to cross-refer to our collections database to find the list of items in the box. 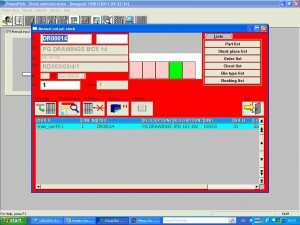 So in order to retrieve a specific object, the user searches for it on the collections database, finds the box number and feeds it into the PowerPick database, which finds the location (machine number, tray number and position on the tray) and tells the appropriate machine to deliver the tray. The boxes have a ‘home location’ in the units and are usually returned to the same position after being taken out, although this can be changed in the database if necessary. On return, the barcode on the box may be scanned to enable the software to find the right location and deliver the correct tray, but in practice the box number is often typed or pasted into the search field. 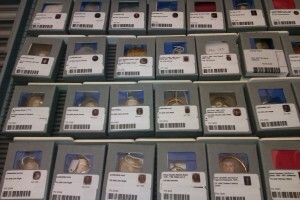 Soon after this we carried out a few smaller barcoding projects to help us to track individual items. In these cases we attached sticky labels of various types to the boxes or packaging of the items. We printed the labels ourselves, which had the advantage that we could include as much extra information on them as we wanted. For the portrait miniatures collection we used conservation standard labels and included an image, the artist name, title and the accession number converted into a barcode. For some reason we always had trouble keeping track of the collection before doing this. The individual miniatures were hard to identify and it was difficult to label them effectively until they were stored in boxes. From the audit point of view it is much quicker to check through them now that they have barcodes. However one issue with ‘do-it-yourself’ labels is that the barcode occasionally turns out to be unreadable. I would say this happens in about 5-10% of cases, whereas for the pre-printed barcodes the failure rate is much less than this. 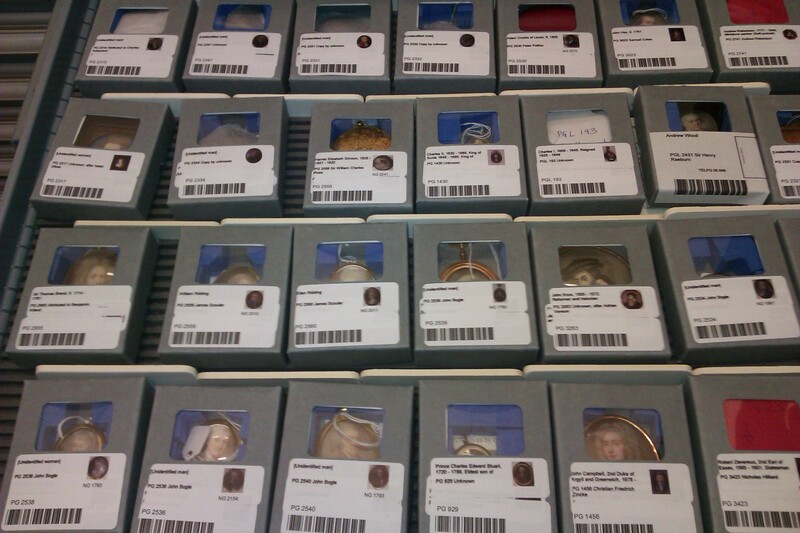 As a follow-up to the portrait miniatures project we added labels with barcodes to the packaging for a collection of portrait medallions, stored in envelopes. These were also hard to track/audit until we did this. Some of my colleagues are now at the start of an audit project for the Scottish National Gallery print room, and as part of this they have begun to attach pre-printed barcoded labels to the boxes there too. Any move that takes place will not happen for a while, so for once we have learned from experience and left ourselves enough time to get organised. The latest instalment in our efforts to drag the organisation into the 20th century [no, I don’t mean the 21st!] is under way. What have we learned (if anything)? We have up to now focussed on barcoding relatively small and insignificant artworks, or more accurately their containers, and not the large valuable ones. This is not because we value the small and insignificant ones more than the others, but because the smaller ones are generally harder to keep track of and easier to mix up with one other. It might be that for the more important/larger items we should be investing in RFID instead of barcode labelling, as this could combine added security with location tracking and/or with condition monitoring. But this is a battle still to be fought. ‘Home-made’ barcodes don’t scan quite as reliably as the pre-printed ones – but you can convert anything you like into a barcode if you print the labels in-house, and it also provides more flexibility, allowing other information to be incorporated as required, and the ability to print off extra labels from time to time. Although barcoding is a good method for providing unambiguous labelling and to facilitate quick audits, there are other methods which would also work if applied with consistency and accuracy. you write about “scrunching” labels and having problems with reading printed barcodes. Both problems can be easily avoided. There are Barcodeprinters which are build to print readable barcodes. If you buy a better one, they come with integrated dispenser. They are also really fast.